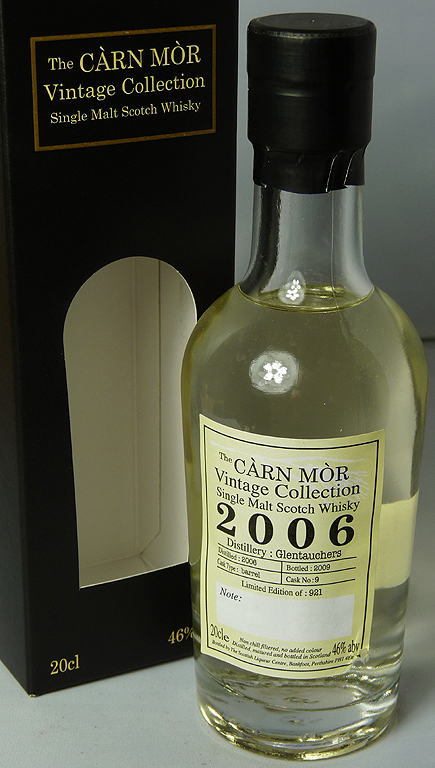 This Glentauchers is part of the 24 x 20cl bottles that make up the Carn Mor Vintage Collection. Distilled in 2006 and bottled in 2009, at 3 years old whisky doesn’t come younger than this! It’s from a limited edition of 921, Cask No: 9. Non-chill filtered, no added colour and 46%. Nose: Summer fruit pie and custard, gooseberries, pot ale and bran. Very youthful but clearly very well made spirit. Taste: Custard tart and cream, tinned peaches, icing sugar. Sweet and quite delicious. Finish: Long, creamy and sweet with the custard theme continuing. Comments: An astonishing 3 year old. A really good example of the quality of this obscure distillery. This entry was posted in Glentauchers and tagged 2006, 20cl, 46%, Carn Mor, Glentauchers, NAS, Single Malt, Single Malts Direct, Speyside. Bookmark the permalink.